The Best Meteor Shower of the Year Is This Weekend. Here's Why It's So Special. It's always a pleasure to catch a meteor streaking through the sky, no matter which of the year's meteor showers you might be gazing up at. However, not every meteor shower is created equal. 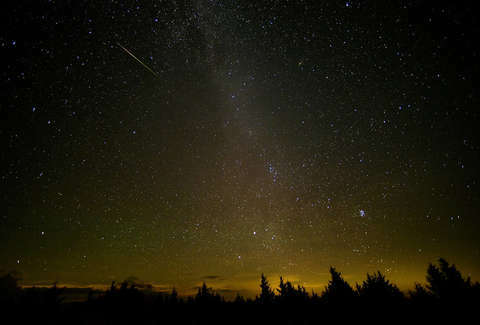 The Perseid meteor shower, arguably the best meteor shower of the year, lands this weekend. The Perseid meteor shower will hit its peak the night of August 12, and it's a can't-miss event. While the Geminid meteor shower in December will produce more meteors per hour, the Perseids present the best opportunity for a night of stargazing. Bill Cooke of NASA's Meteoroid Environment Office previously told Thrillist there could be up to 100 meteors per hour during this year's Perseids, though it's more likely to be in the 60-70 range (in an outburst year, the Perseids can produce hundreds per hour). What makes the Perseids great is a combination of factors, including the chance that you'll have a beautiful night to sit outside because the event lands in the summer. Additionally, the storm has a "broad peak," according to Jane Houston Jones of NASA's Jet Propulsion Laboratory. That means the night of August 12 into August 13 is the peak, but the night of August 11 into August 12 will also be a fruitful night to get out, making any night you can catch them over the weekend pretty spectacular. In fact, you'll be able to see quite a few meteors in the sky for a handful of days in either direction from the peak -- both later this week and early next week. Even better yet, the conditions are favorable to make sure you get to see as many of the Perseids' meteors and bright fireballs as possible. A new moon arrives on August 11, which means there will be next to no light interference from the moon that could obscure meteors from sight. The only other factosr you'll have to consider before heading out is your local weather conditions and whether you can get some place dark enough (away from light pollution) to watch the show. So, make plans to spend a little time outside this weekend. Dustin Nelson is a News Writer with Thrillist. He holds a Guinness World Record but has never met the fingernail lady. Follow him @dlukenelson.